Please understand entries will be restricted during the performances. Groups of students will attend the performances on Tuesday 22 at 2:00pm and on Wednesday 30 at 7:00pm. If black ships sing, history moves. Advance without stopping, the floating island Japan! Premiered in Broadway in 1976, the musical Pacific Overtures won Tony Awards in two categories for its unique concepts and swept over the American theatrical world. The fast-paced musical depicts the confusion in Japan triggered by the arrival of black ships from America toward the end of the Edo period (1603-1867) and the people who were at the mercy of the turbulent history that followed the incident. 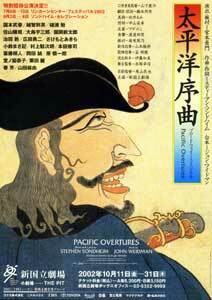 The previous 2000 performance at the New National Theatre, Tokyo, which was the Japanese premiere based on a translation of the original script, became a high-profile event for its novelty that has never been lost even today and also for its high level of perfection in stage direction that fully brought that novelty out. Stephen Sondheim, who wrote both the music and words for the musical, is a great master, well known for his lyrics for The West Side Story, as well as for his music and lyrics for A Little Night Music, Company and other works. He gained an undisputable position with his bold melodies and story lines. When he visited Japan to receive a Praemium Imperiale global arts prize, he went to see the musical performed at the NNTT. He rated the performance highly and commented, "I think the performance fully conveyed my intentions. It was impressive." His own strong recommendations have made it possible for the musical to be performed in the United States this summer--during the Lincoln Center Festival 2002 in New York from July 9 to 13 and during the Sondheim Celebrations in Washington, D.C. from September 3 to 8. Further expectations for the forthcoming performance of the musical at the NNTT will rise after it is performed in the two American cities. The comprehensive capabilities of creative staff members and refined singing by a stunning cast of singers with stage direction by Miyamoto Amon, who skillfully brings talents of distinct personalities together, will turn Pacific Overtures into an even more sophisticated and dynamic work. Look forward to its performance. Japan during the middle of the 19th century, when a national isolationist policy was being adopted. A fleet of American black ships suddenly arrives at the port of Uraga. The Tokugawa shogunate orders Kayama Yazaemon to stop the landing of the ships' crew members. Yazaemon, together with Manjiro, who has returned to Japan after mastering Western culture, successfully turns away the black ships using a clever scheme. Subsequently, however, Britain, France, the Netherlands, and Russia urge the shogunate to open the country and to conclude a commercial treaty with these countries one after another. Yazaemon soon inclines himself to Western culture and becomes fiercely opposed to Manjiro, who has by contrast come to value the traditions of Japan. Thus, the situation begins to develop in an unexpected direction.